Although this home suffered only minor exterior damage from Hurricane Katrina, small leaks and inadequate air flow permitted this mold infestation. HVAC systems can create all three requirements for significant mold growth. The A/C system creates a difference in temperature that allows/causes condensation to occur. The high rate of dusty air movement through an HVAC system may create ample sources of food for the mold. And finally, since the A/C system is not always running – the ability for warm conditions to exist on a regular basis allows for the final component for active mold growth. The sampling and analysis should follow the recommendations of Occupational Safety and Health Administration (OSHA), National Institute for Occupational Safety and Health (NIOSH), Environmental Protection Agency (EPA), and the American Industrial Hygiene Association (AIHA). Most importantly, when a sample is taken the proper chain of custody should be adhered to. The AIHA offers lists of accredited laboratories that submit to required quarterly proficiency testing. Though it may not be recommended, air sampling following mold remediation is usually the best way to ascertain efficacy of remediation, when conducted by a qualified third party. There are many ways to prevent mold growth; see heating, ventilating, improved insulation and air conditioning. There are also cleaning companies that specialize in fabric restoration – a process by which mold and mold spores are removed from clothing to eliminate odor and prevent further mold growth and damage to the garments. Improper methods for cleaning mold include exposure to high heat, dry air, sunlight (particularly UV light), ozone, and application of fungicides. These methods may render the mold non-viable, however, the mold and its by-products can still elicit negative health effects. As noted in following sections, the only proper way to clean mold is to use detergent solutions that physically remove mold. Many commercially available detergents marketed for mold clean-up also include an anti-fungal agent. Significant mold growth may require professional mold remediation to remove the affected building materials and eradicate the source of excess moisture. In extreme cases of mold growth in buildings, it may be more cost-effective to condemn the building rather than clean the mold to safe levels. The goal of remediation is to remove or clean contaminated materials in a way that prevents the emission of fungi and dust contaminated with fungi from leaving a work area and entering an occupied or non-abatement area, while protecting the health of workers performing the abatement. Before beginning mold remediation you should make sure you assess the area infected with mold to ensure safety, you clean up the entire moldy area, and properly approach the mold. Make sure to remove the contaminated HVAC filter media to ensure your HVAC system is not bringing in contaminated air. Make sure to dispose of it reading the same regulations listed above. Remove any debris and insulation; clean all components of the HVAC system to ensure nothing becomes contaminated and/or more contaminated from floodwater. Use a HEPA-filtered vacuum, cleaner to make sure you get rid of all the debris, dirt, and microorganisms. Pay special attention to the drain pans, filter areas, curves, and air ducts since debris often collects in these places. Disinfect all components of the HVAC system after turning off the HVAC system. To clean use 1 cup of normal household chlorine bleach mixed with a gallon of water, do not mix this with cleaning products containing ammonia. Be sure to use fans to create filtration by blowing the contaminated air outdoors, to protect the health of the workers. After cleaning all components with bleach rinse with clean water to eliminate the potent bleach smells. Important: You must remove and properly discard the HVAC components that are contaminated with floodwater to prevent the growth of mold if it cannot be cleaned, and replace them with new components. After the HVAC has been properly cleaned and disinfected, replace the insulation in the HVAC system with an external, smooth-surfaced insulation to prevent future floodwater contamination. To ensure safety have your HVAC system tested by a qualified professional before you begin using your HVAC system again. When cleaning up mold it is important to avoid breathing in mold or mold spores, as this can have major health implications. To avoid airborne mold exposure you should wear a respirator to protect your lungs. Half-face or full-face respirators have removable cartridges that will stop the mold spores from entering your nose or mouth. A full-face respirator will also protect your eyes. Be sure to follow the directions carefully, if it does not fit properly or is not put on correctly it may be ineffective. Filters used with the respirator should ideally be rated P-100. Some cartridges also come with an activated carbon element. The carbon helps to remove the odor given off by mold and mildew. Protective clothing should also be worn. Disposable hazmat coveralls are available to keep out particles down to one micrometer. Protective suits keep mold spores from entering any cuts on the skin. Next be sure to wear gloves to ensure protection from mold. You should wear gloves made of rubber, nitrile, polyurethane, or neoprene so that no mold or disinfectant materials get through to your skin. If a half-face respirator mask is used, goggles should be worn to keep mold spores from entering the mucus membrane and propagating. Appropriate goggles should not have ventilation holes so that no mold particles will get in. Full face respirators have an advantage here as the air breathed in is directed to the inside of the lens first which keeps it from fogging as you work. These systems are known for the removal of the biological material in the ductwork that the mold spores feed upon. A good brushing or agitation machine will break the static bond and remove the hard and soft debris in the ductwork. Dry brushing introduces nothing foreign into the HVAC system and is the only system that sweeps all surfaces. Recently, some companies have begun using dry ice blasting to remove mold from suitable surfaces, such as wood and cement. Soda Blasting is also a good method to remove the mold. Media Blasting, which removes mold is a preferred method to encapsulation, which only cover the mold. Damp wipe is the removal of mold from non-porous surfaces by wiping or scrubbing with water and a detergent. Care must be exercised to make sure the material is allowed to quickly dry to discourage any further mold growth. With surfaces such as metal, glass, hardwood, plastics, and concrete, mold should be scraped off as much as possible. Then, scrub the surface with a moldicide or fungicide cleaner. High Efficiency Particulate Air filtered vacuum cleaners are used in the final cleanup of remediation areas after materials have been thoroughly dried and all contaminated materials have been removed. HEPA vacuum cleaners are recommended for the cleanup of the outside areas surrounding the remediation area. During this process the workers wear proper personal protective equipment (PPE) to prevent exposure to mold and other contaminants. The collected debris and dust should be stored in impervious bags or containers in a manner to prevent any release of debris. Moisture meter: a tool that measures the moisture level in building materials. It can also be used to measure the progress of the drying of damaged materials. Pin moisture meters have a small probe that is inserted into the material. Pinless moisture meters usually have a flat sensing area that is pressed directly against the material’s surface. Moisture meters can be used on carpet, wallboard, woods, brick, and other masonry. Borescope: a hand-held tool that allows the user to see potential mold problems inside walls, ceilings, crawl spaces, and other tight spaces. It consists of a camera on the end of a flexible “snake”. No major drilling or cutting of dry wall is required. Digital camera: used to document findings during assessment. Personal protective equipment (PPE): includes respirators, gloves, impervious suit, and eye protection. These items can be used during the assessment and remediation processes. Thermographic camera : Infrared thermal imaging cameras are often used (and effective) in addition to moisture meters to double check moisture meter findings, and look at the broader picture. They help mainly in identifying auxiliary points of moisture intrusion. Small Isolated Areas (10 sq ft (0.93 m2) or less) for example, ceiling tiles, small areas on walls. Remediation can be conducted by the regular building staff as long as they are trained on proper clean-up methods, personal protection, and potential hazards. This training can be performed as part of a program to comply with the requirements of OSHA Hazard Communication Standard ( 29 CFR 1910.1200). The work area should be unoccupied. Removing people from spaces adjacent to the work area is not necessary, but is recommended for infants (less than 12 months old), persons recovering from recent surgery, immune-suppressed, or people with respiratory diseases. Containment of the work area is not necessary. However, misting and dust suppression is recommended. The work area(s) used by workers for access/egress should be cleaned with a damp cloth or mop and a detergent. All areas should be left dry and visibly free of contamination and debris. Mid-sized Isolated Areas (10-30 sq ft) – for example, individual wallboard panels. Remediation can be conducted by the regular building staff as long as they are trained as for Level I. Respiratory protection, occupation of the work and adjacent areas, and handling of contaminated materials are the same as for Level I. Surfaces in the work area that could become contaminated should be covered with sheet(s) of plastic that are secured in place. This should be done prior to any remediation process to prevent further contamination. The work area(s) used by workers for access/egress should be HEPA vacuumed and cleaned with a damp cloth or mop and a detergent. As with Level I, all areas should be left dry and visibly free of contamination and debris. It is recommended that personnel be trained in the handling of hazardous materials and equipped with respiratory protection (N-95 disposable respirator). Respirators must be used in accordance with OSHA respiratory protection standard (29 CFR 1910.134) Gloves and eye protection should also be worn. Surfaces in the work area and areas directly adjacent that could become contaminated should be covered with a secured plastics sheet(s) before remediation to contain dust/debris and prevent further contamination. The work area and areas directly adjacent should be unoccupied. Removing people from spaces adjacent to the work area is not necessary, but is recommended for infants (less than 12 month old), persons recovering from recent surgery, immune-suppressed or people with respiratory diseases. Dust suppression methods, such as misting (not soakings) surface prior to remediation, are recommended. The work area/areas used by workers for access/egress should be HEPA vacuumed and cleaned with a damp cloth or mop and a detergent. In conclusion, after the moisture source has been eliminated and the mold growth removed, the premises should be revisited and then re-evaluated to ensure the mold growth and the remediation process was successful. The premises should be free of any moldy smells or visible growth. Humidity in the indoor environment is a major problem that can lead to mold growth if it is not kept below sixty percent. If one is not certain what is the humidity level in your home one can purchase a humidity meter at any hardware store. If one sees any moisture or condensation, one should act quickly by drying the wet surface and find the water source so it can be avoided in the future. Any exposed structural wood or wood framing should be encapsulated with an EPA approved fungicidal encapsulation coating after pre-cleaning methods have been applied. Areas of typical concern can be found in homes that have a crawl space and unfinished basement. Attic’s with poor ventilation can have spikes of high humidity throughout the year and can benefit from using an EPA approved fungicidal encapsulation coating. Different restoration methods and measures are used depending on the type of fire damage that occurred. Fire damage can be performed by property management teams, building maintenance personnel, or by the homeowners themselves; however, contacting a certified professional fire damage restoration specialist is often regarded as the safest way to restore fire damaged property due to their training and extensive experience. Most are usually listed under “Fire and Water Restoration” and they can help speed repairs, whether for individual homeowners or for the largest of institutions. Fire and Water Restoration companies are regulated by the appropriate state’s Department of Consumer Affairs – usually the state contractors license board. In California, all Fire and Water Restoration companies must register with the California Contractors State License Board. Presently, the California Contractors State License Board has no specific classification for “water and fire damage restoration.” Hence, the Contractor’s State License Board requires both an asbestos certification (ASB) as well as a demolition classification (C-21) in order to perform Fire and Water Restoration work. High winds are known to cause damage, depending upon their strength. Infrequent wind gusts can cause poorly designed suspension bridges to sway. When wind gusts are at a similar frequency to the swaying of the bridge, the bridge can be destroyed more easily, such as what occurred with the Tacoma Narrows Bridge in 1940. Wind speeds as low as 23 knots (43 km/h) can lead to power outages due to tree branches disrupting the flow of energy through power lines. While no species of tree is guaranteed to stand up to hurricane-force winds, those with shallow roots are more prone to uproot, and brittle trees such as eucalyptus, sea hibiscus, and avocado are more prone to damage. Hurricane-force winds cause substantial damage to mobile homes, and begin to structurally damage homes with foundations. Winds of this strength due to downsloped winds off terrain have been known to shatter windows and sandblast paint from cars. Once winds exceed 135 knots (250 km/h), homes completely collapse, and significant damage is done to larger buildings. Total destruction to man-made structures occurs when winds reach 175 knots (324 km/h). The Saffir-Simpson scale and Enhanced Fujita scale were designed to help estimate wind speed from the damage caused by high winds related to tropical cyclones and tornadoes, and vice versa. A dangerous rotating column of air in contact with both the surface of the earth and the base of a cumulonimbus cloud (thundercloud) or a cumulus cloud, in rare cases. Tornadoes come in many sizes but typically form a visible condensation funnel whose narrowest end reaches the earth and surrounded by a cloud of debris and dust. Tornadoes wind speeds generally average between 40 miles per hour (64 km/h) and 110 miles per hour (180 km/h). They are approximately 250 feet (76 m) across and travel a few miles (kilometers) before dissipating. Some attain wind speeds in excess of 300 miles per hour (480 km/h), may stretch more than a mile (1.6 km) across, and maintain contact with the ground for dozens of miles (more than 100 km). Tornadoes, despite being one of the most destructive weather phenomena are generally short lived. A long-lived tornado generally lasts no more than an hour, but some have been known to last for 2 hours or longer (for example, the Tri-State Tornado). Due to their relatively short duration, less information is known about the development and formation of tornadoes. Downbursts are created within thunderstorms by significantly rain-cooled air, which, upon reaching ground level, spreads out in all directions and produce strong winds. 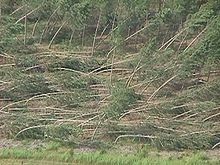 Unlike winds in a tornado, winds in a downburst are not rotational but are directed outwards from the point where they strike land or water. “Dry downbursts” are associated with thunderstorms with very little precipitation, while wet downbursts are generated by thunderstorms with large amounts. Microbursts are very small and macrobursts are large-scale downbursts. The heat burst is created by vertical currents on the backside of old outflow boundaries and squall lines where rainfall is lacking. Heat bursts generate significantly higher temperatures due to the lack of rain-cooled air in their formation. Derechos are longer, usually stronger, forms of downburst winds characterized by straight-lined windstorms. Downbursts create vertical wind shear or microbursts, which are dangerous to aviation. They can also cause tornado-like damage on the ground and, depending on the size of the downburst, can generate winds at speeds of up to 168 miles per hour (270 km/h). Downbursts also occur much more frequently than tornadoes, with ten downburst damage reports for every one tornado. A squall line is an elongated line of severe thunderstorms that can form along or ahead of a cold front. The squall line typically contains heavy precipitation, hail, frequent lightning, strong straight line winds, and possibly tornadoes or waterspouts. Severe weather in the form of strong straight-line winds can be expected in areas where the squall line forms a bow echo, in the farthest portion of the bow. Tornadoes can be found along waves within a line echo wave pattern (LEWP) where mesoscale low pressure areas are present. Some[which?] summer bow echoes are called derechos, and move quickly over large territories. A wake low or a mesoscale low pressure area forms behind the rain shield (a high pressure system under the rain canopy) of a mature squall line and is sometimes associated with a heat burst. Squall lines often cause severe straight-line wind damage, and most non-tornadic wind damage is caused from squall lines. Although the primary danger from squall lines is straight-line winds, some squall lines also contain weak tornadoes. Very high winds can be caused by mature tropical cyclones (called hurricanes in the United States and Canada and typhoons in eastern Asia). A tropical cyclone’s heavy surf created by such winds may cause harm to marine life either close to or upon the surface of the water, such as coral reefs. Coastal regions may receive significant damage from a tropical cyclone while inland regions are relatively safe from the strong winds, due to their rapid dissipation over land. However, severe flooding can occur even far inland because of high amounts of rain from tropical cyclones and their remnants.